Who sent you flowers ? 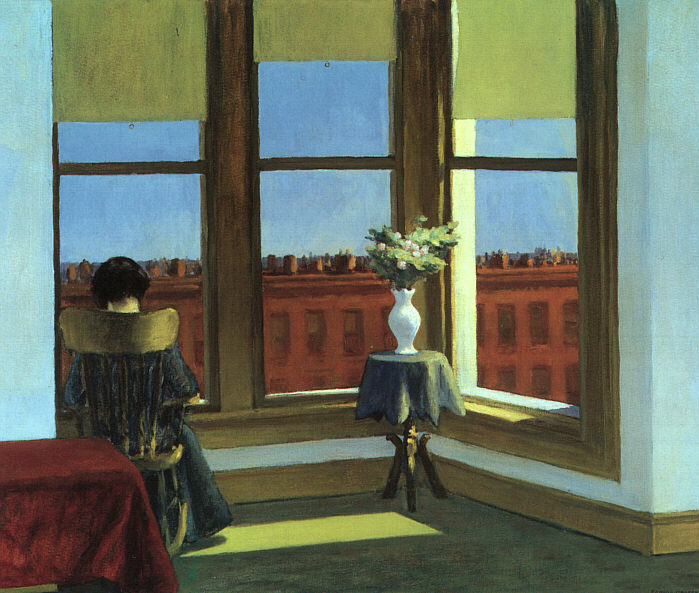 The Room In Brooklyn artwork is from 'Marshall's House (Study)' (2003), oil on canvas, 44" x 82"
Room In Brooklyn (1932) by Edward Hopper. The world-closing-in mood of the painting is captured by the claustrophobic set of the Room In Brooklyn video. Time hangs heavy in the work of Edward Hopper, where windows provide a notional view of the exterior world - but they also confine his characters. The windows appear as the only access to the outside in an otherwise imprisoning interior - a point of connection with the public domain that only serves to underline the overriding sense of separation. Taking the vase of flowers beside the seated figure as its starting point, the song heightens the existentialist despair by drawing out the homophone wordplay: "You got the floor to ceiling windowpane" / "You got the floor to ceiling window, pain". From its elevated vantage point, this narrative is a 'tall' story; situated eight flights high, the lady also inhabits a tall storey. If we think of the perfume essence of these flowers, the phrasing of the opening verse may be moving into the territory of oronym (or perhaps a mondegreen on my part ! ): "Who sent you flowers ?" / "Whose scent, your flowers ?". "The scent hangs heavy in the air", but something else looms large here; given that down is the only place left to go, would it also be occupying the mind of the woman that "descent hangs heavy in the air" ? With Squire attempting to glean whatever contextual details he can from the retiring resident, "Tall as your stor(e)y" doubles as "Tell us your stor(e)y". A shaft of light illuminates the floor beside the seated figure, just as in Excursion into Philosophy (1959), where a middle-aged man sits dejectedly on the edge of a bed. Beside him lays an open book and a partially clad female. Jo Hopper noted in their log book, "the open book is Plato, reread too late." Plato's philosopher, in search of the real and the true, is urged to turn away from this transitory realm and contemplate the eternal Forms and Ideas. 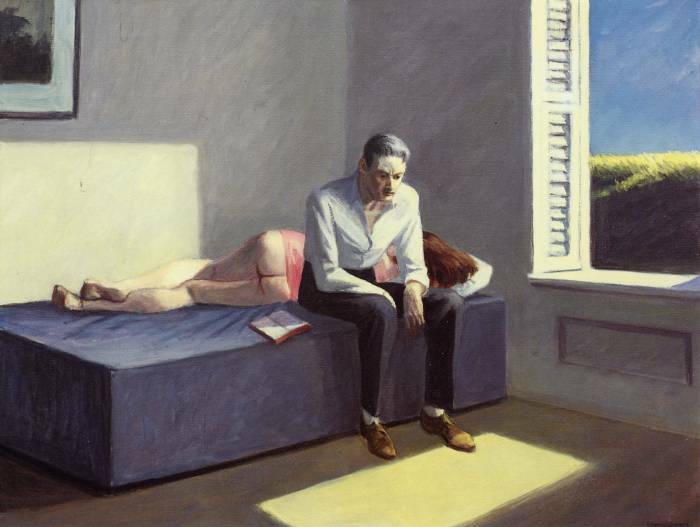 The pensive man in Hopper's painting is positioned between the lure of the earthly domain, represented by the woman, and the call of the higher spiritual domain, represented by the ethereal lightfall. The pain of thinking about this choice and its consequences, after immersing himself all night in the world of Plato is evident; he is paralysed by the fervent inner labour of the melancholic. Excursion into Philosophy (1959) by Edward Hopper. The people in Hopper's paintings are disconnected from one another, awkwardly posed, their bodies jutting in different planes, their gazes distant and empty, their conversation frozen. There is a lonely questioning in the isolated stares of his subjects, and his paintings of empty hotel rooms and street corners provoke existential questions. We witness a moment of existential reflection in the life of the character sitting on the edge of the bed. As with Summer in the City (1949), the figure dwells partly in sunshine, partly in shadow. Perhaps he is caught between the past and the future, or on the cusp between the worldly and the spiritual. Do we choose the darkness or the light ? 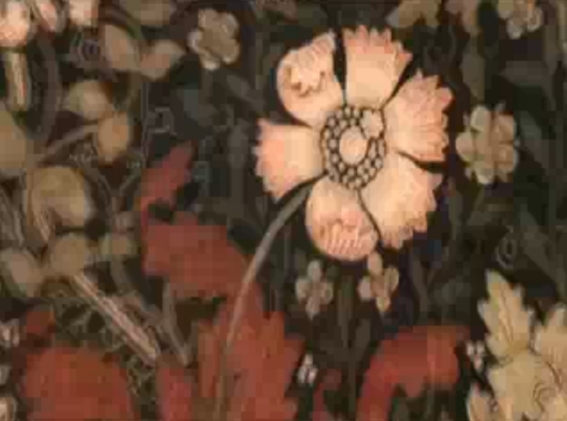 The Room In Brooklyn music video features the 'Compton' wallpaper design of William Morris (1834 - 1896), an English architect, furniture and textile designer, artist, writer, and socialist associated with the Pre-Raphaelite Brotherhood and the English Arts and Crafts Movement. Left: Room In Brooklyn video. Right: Compton (1896) by William Morris. 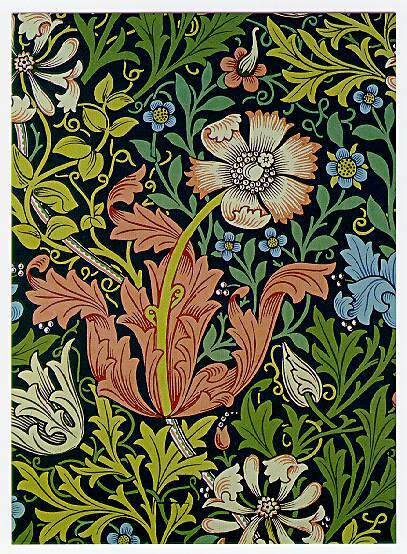 William Morris patterns graced the romantic bohemian jackets of the Psychedelic era, when art and fashion were recut with a vintage eye. 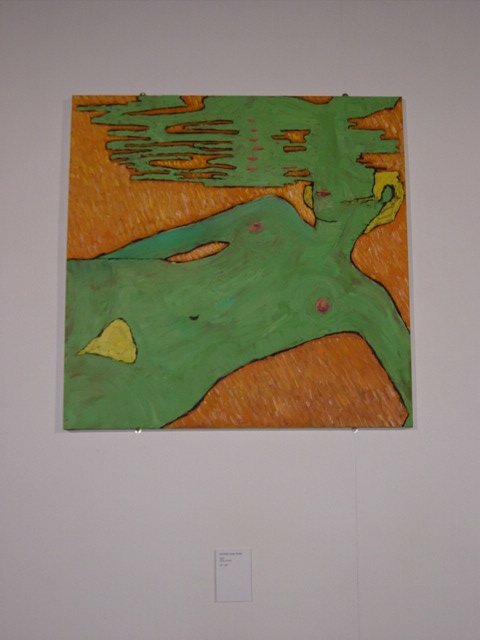 The Room In Brooklyn cover artwork, entitled 'Marshall's House', was originally intended to be used as the cover of John's second solo LP of the same name, but instead was used as the cover of Room In Brooklyn. 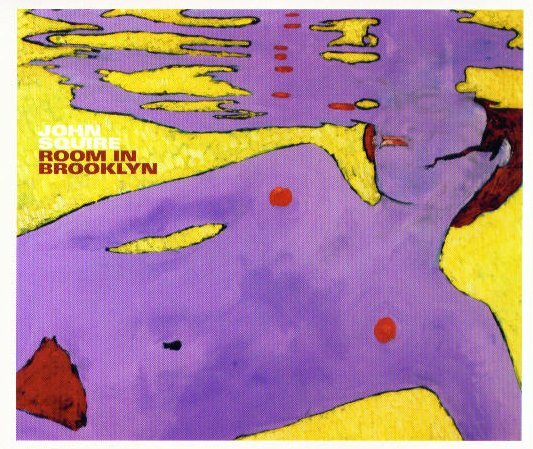 Top : Room In Brooklyn cover artwork. 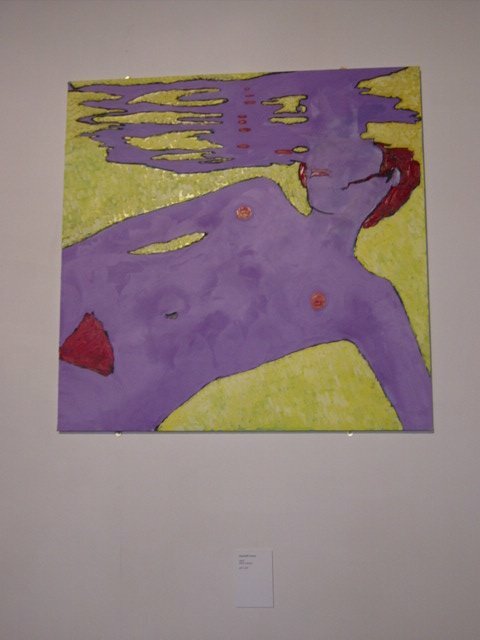 Bottom: 'Marshall's House' (oil on canvas, 60" x 60", 2003, left), and 'Marshall's House (Study)' (oil on canvas, 44" x 82", 2003, right), from the Manchester exhibition, May 2004.